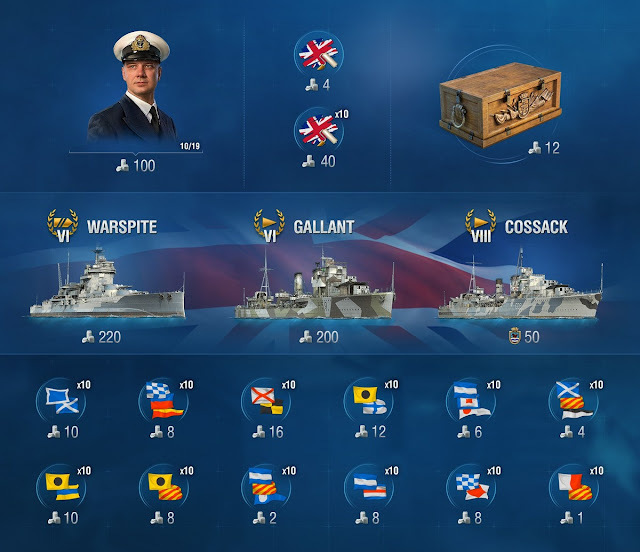 The British Arc starts in World of Warships with the release of Update 0.7.9. 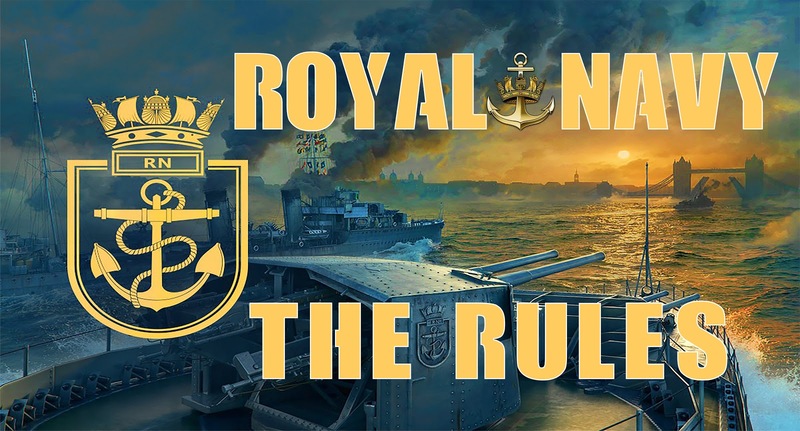 The next three months will revolve around the launch of British destroyers and the Royal Navy event that accompanies them. This article is your guide for all the details surrounding the event. 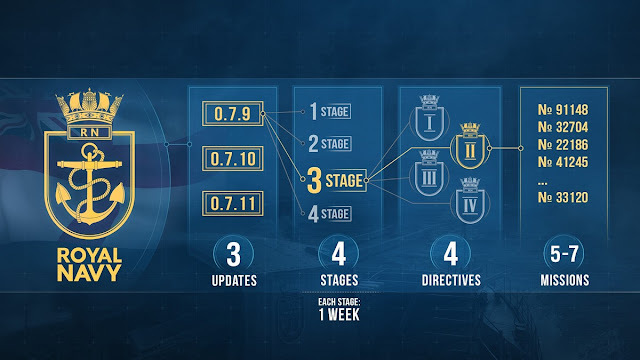 Please note that the Royal Navy category and the ability to use Sovereigns to obtain its contents will become available in Update 0.7.10 on NA Server (Oct 17), so you'll have plenty of time to choose the items you want. 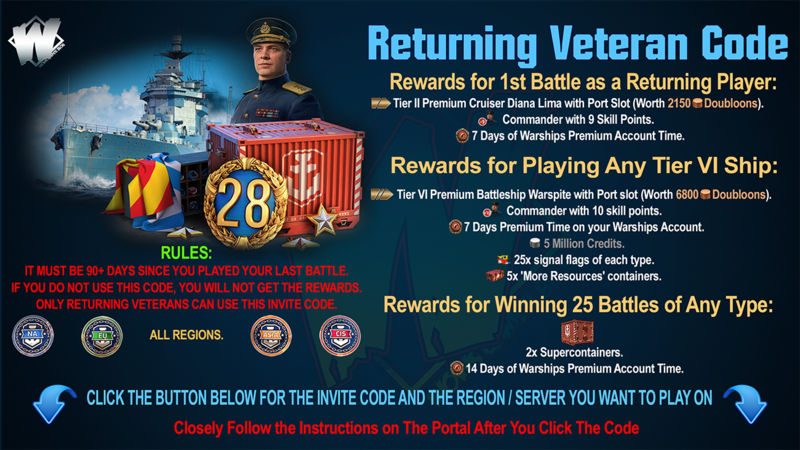 With the release of Update 0.7.11 on NA Server (Nov 14), each Sovereign in your possession will be exchanged for 25,000 credits. Guineas will remain available in the client until at least Update 0.7.12 on NA Server (Dec 12) inclusive. After that they will be exchanged for credits. 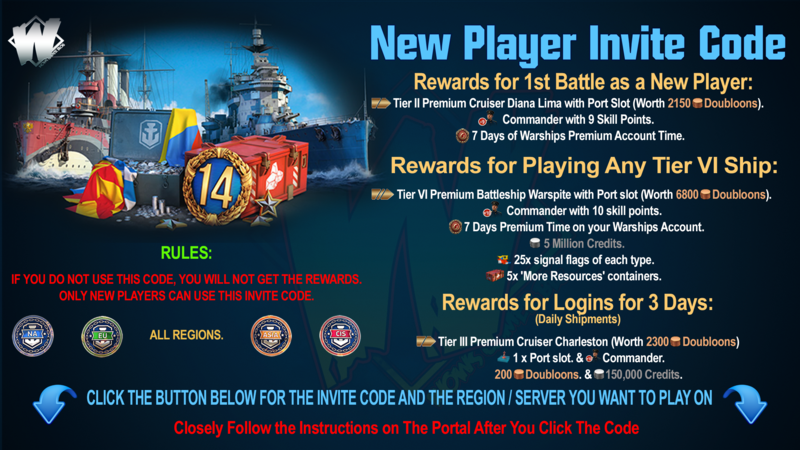 Players who have reached the 12th level of their Service Record will be able to participate in the Royal Navy event. 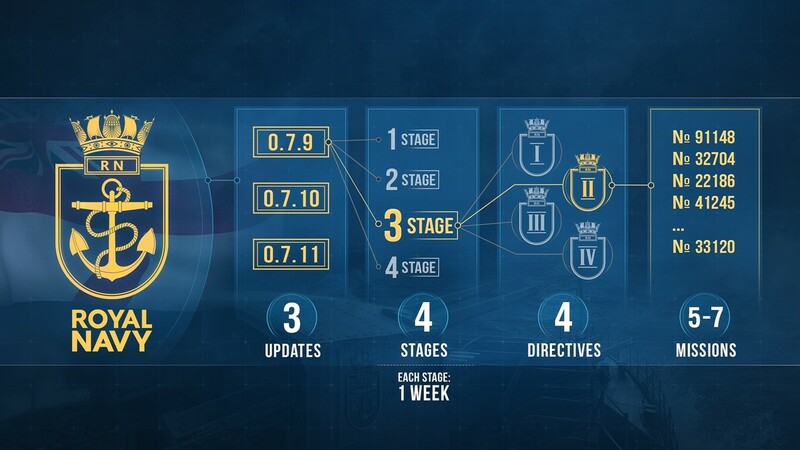 Tier V or higher ships are allowed and the following game modes will be available—Random, Co-op, and Ranked Battles, as well as the new test mode, Arms Race. You can learn more about the Arms Race mode in this dedicated article. 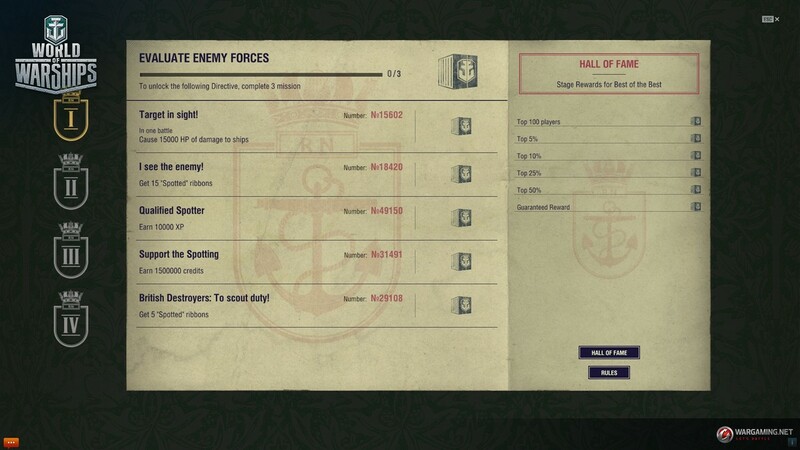 In the third week, you'll have the opportunity to complete one of the missions from Operation Dynamo. In future, Clan Battles will be also added to this list. The rules are simpler than they might initially seem: each update will feature four stages, each being one week long. Each stage will include four Directives, and these Directives will each comprise of 5 to 7 missions. 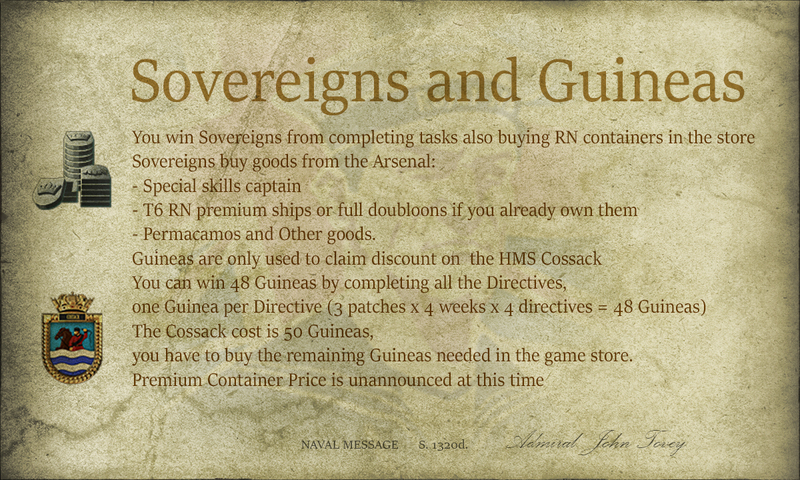 The rewards include two temporary resources for the Arsenal—Sovereigns and Guineas. 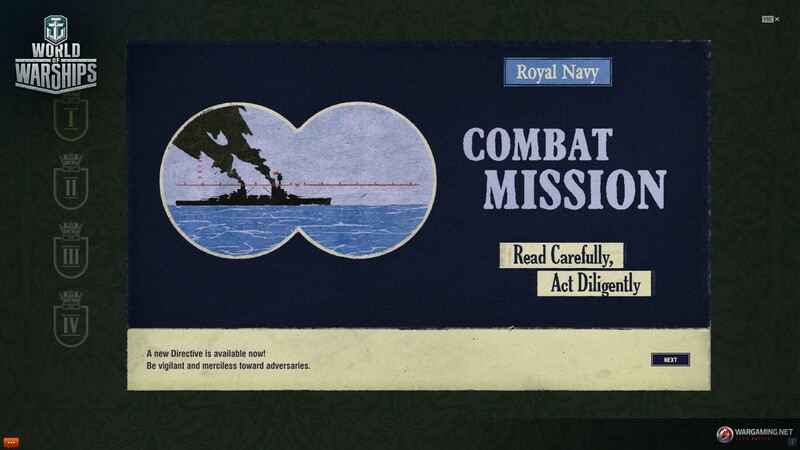 Pay attention, some of the missions can be completed only on British destroyers. All missions can be completed simultaneously. 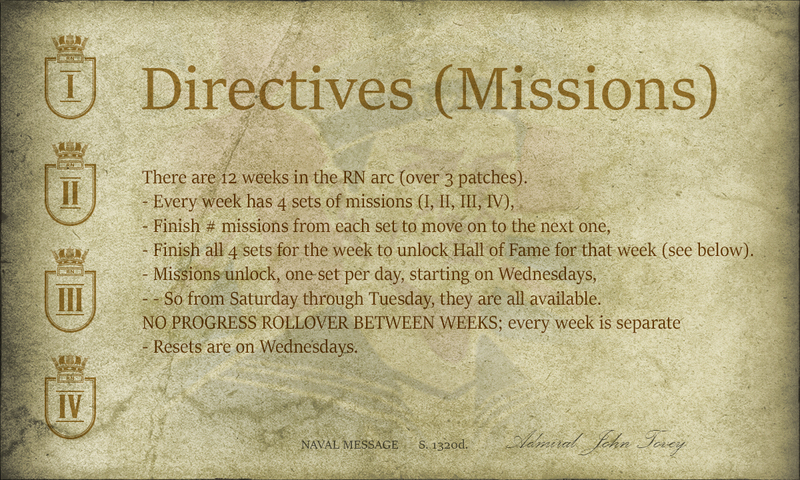 Access to the next Directive is granted once you have completed a specified number of missions—from three to five, but not earlier than the day the Directive is unlocked. Each stage has both economic missions (earn Credits and XP) and combat missions (deal damage and earn ribbons). Only the first Directive unlocks on the first day of the first stage, the second one unlocks on the second day, and so on. All the missions from a stage are available until its end, so you can launch the game on the fourth day, for example, and complete everything in one day. Take note that in order to move on to the next Directive you need to complete a certain number of missions from the previous one and wait for the day on which the next Directive unlocks. As the new stage begins, the missions from the previous stage become unavailable. The only exception is the very first stage, with Directives 1 and 2 unlocking on the first day. 1 consumable Union Jack camouflage — 4 Sovereigns. 10 consumable Union Jack camouflages — 40 Sovereigns. Commander Bert Dunkirk with 10 skill points — 100 Sovereigns, can be purchased only once. If you already have the commander on your account, you won't be able to make the exchange again. Jack of All Trades: -10% to the reload time of all consumables (instead of -5%). Expert Marksman: +1 deg/s to turret rotation speed for guns with a caliber of more than 139 mm; +3 deg/s to turret rotation speed for guns with a caliber of up to 139 mm (instead of 0.7 deg/s and 2.5 deg/s). Smoke Screen Expert: +30% to smoke screen radius (instead of +20%). A permanent camouflage for Gallant — 40 Sovereigns, can be purchased only once. –3% to ship's detectability range. +4% to maximum dispersion of enemy shells. A Royal Navy container — 12 Sovereigns. 5 Royal Navy containers — 60 Sovereigns. 10 India Delta signals — 10 Sovereigns. 10 India Yankee signals — 8 Sovereigns. 10 Juliet Yankee Bissotwo signals — 2 Sovereigns. 10 Juliet Charlie signals — 8 Sovereigns. 10 November Foxtrot signals — 8 Sovereigns. 10 Hotel Yankee signals — 1 Sovereigns. 10 Sierra Mike signals — 10 Sovereigns. 10 November Echo Setteseven — 8 Sovereigns. 10 Victor Lima signals — 16 Sovereigns. 10 India X-Ray signals — 12 Sovereigns. 10 Juliet Whiskey Unaone signals — 6 Sovereigns. 10 Mike Yankee Soxisix signals — 4 Sovereigns. Please note that the Royal Navy category and the ability to use Sovereigns to obtain its contents will become available in Update 0.7.10, so you'll have plenty of time to choose the items you want. 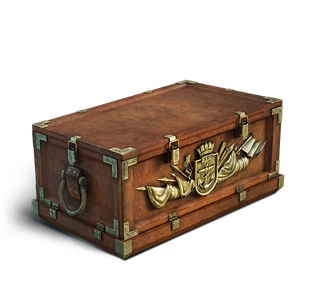 With the release of Update 0.7.11, each Sovereign in your possession will be exchanged for 25,000 credits. 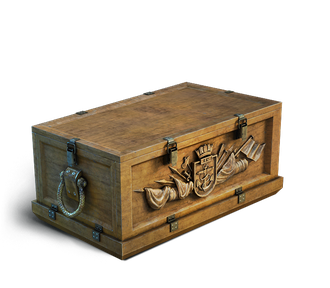 If you already have this ship in your Port and purchase it again, you'll receive 9,600 doubloons. Guineas will remain available in the client until at least Update 0.7.12 inclusive. After that they will be exchanged for credits. +100% XP for a battle. +75% Commander XP for a battle. +50% Free XP for a battle. 1 special signal (Basilisk, Hydra, Leviathan) or one consumable Union Jack camouflage. 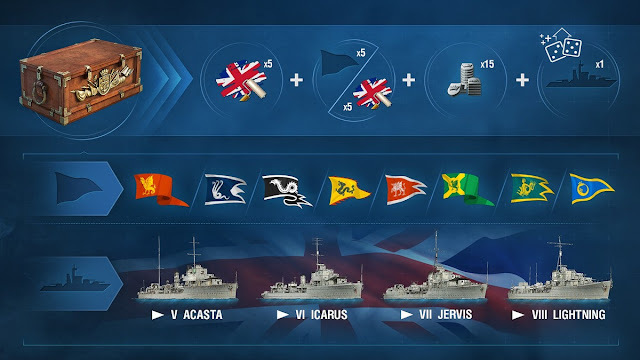 A chance to get one of the British destroyers prior to their release: Tier V Acasta, Tier VI Icarus, Tier VII Jervis, and Tier VIII Lightning. 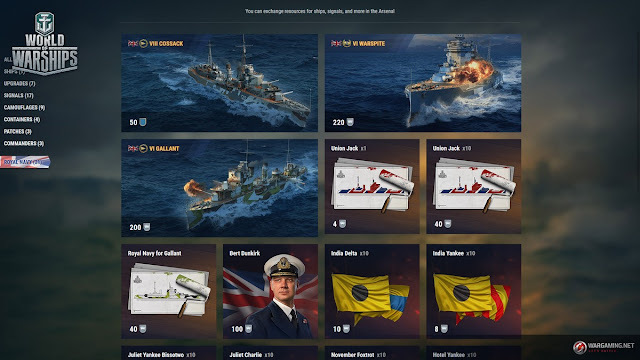 5 new consumable Union Jack camouflages. 5 special signals (Basilisk, Hydra, Leviathan, Dragon, Red Dragon, Wyvern, Scylla or Ouroboros) or 5 new consumable Union Jack camouflages. An increased chance to get one of the British destroyers before their release: Tier V Acasta, Tier VI Icarus, Tier VII Jervis, and Tier VIII Lightning. Once you complete the fourth Directive, you'll have access to the Hall of Fame. 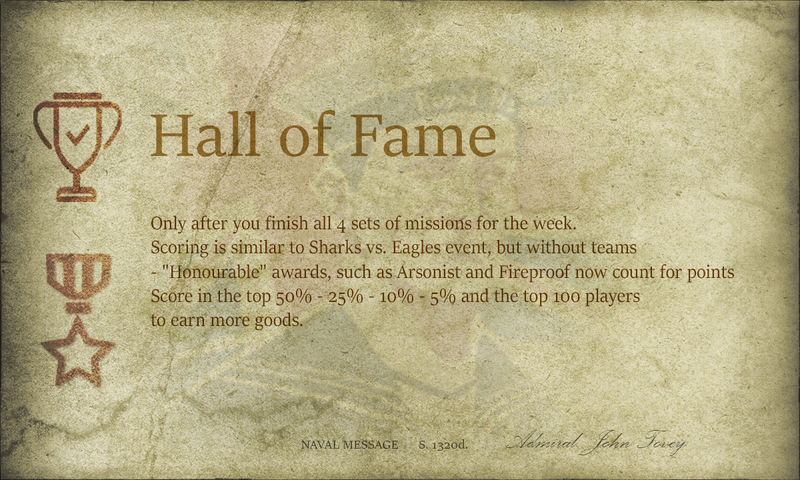 Here you can compete for a spot amongst the top players, with all of those who earn at least one point according to the Hall's special rules, receiving rewards. The reward you receive at the end of a week can be increased further if you enter the top 50%, 25%, 10%, or 5% of best players. Points can be earned in Random, Co-op, Scenario, Ranked, and Special Battles. The Top 100 players of the week receive a special achievement—“Amongst Heroes”—as a reward. 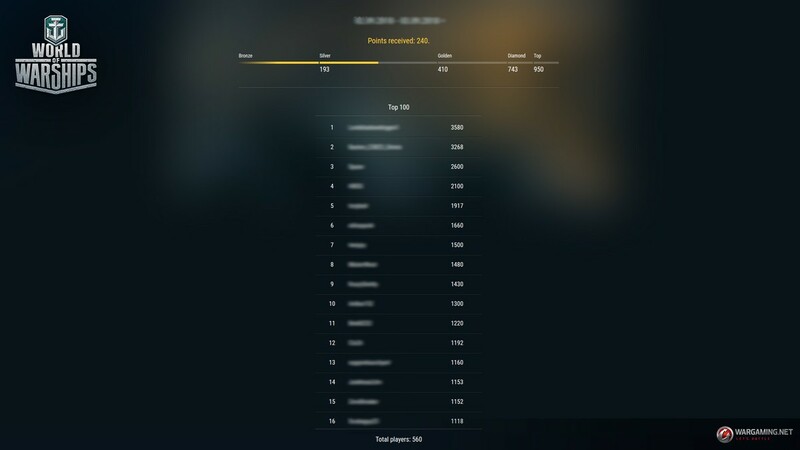 If two or more players are at the borderline, with all occupying 100th position and scoring the same number of points, they all get to the top. The results are summed up once a week. The crediting of points is put on hold three hours before the beginning of the next stage. A special announcement in the Port will warn you about this. Players who manage to enter a battle before the cut-off will receive their points as usual, while battles that begin after 05:00 CEST will not be considered. Please pay attention that the results of the last stage of an update will be summed up a further one hour earlier. When one hour expires, the results are drawn up automatically. The following two hours are necessary for mission preparation of the following stage. The results of the past stages will be available on the results page. 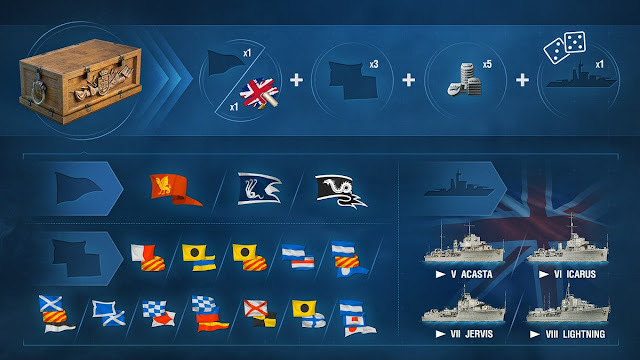 A new temporary category will appear in the Arsenal—Royal Navy, together with new temporary resources—Sovereigns and Guineas. You can spend your Sovereigns on the new Royal Navy camouflage, purchase combat signals, recruit commander Bert Dunkirk, or moor such ships as Warspite and Gallant in your port—the latter of which can be decorated with a special permanent camouflage. 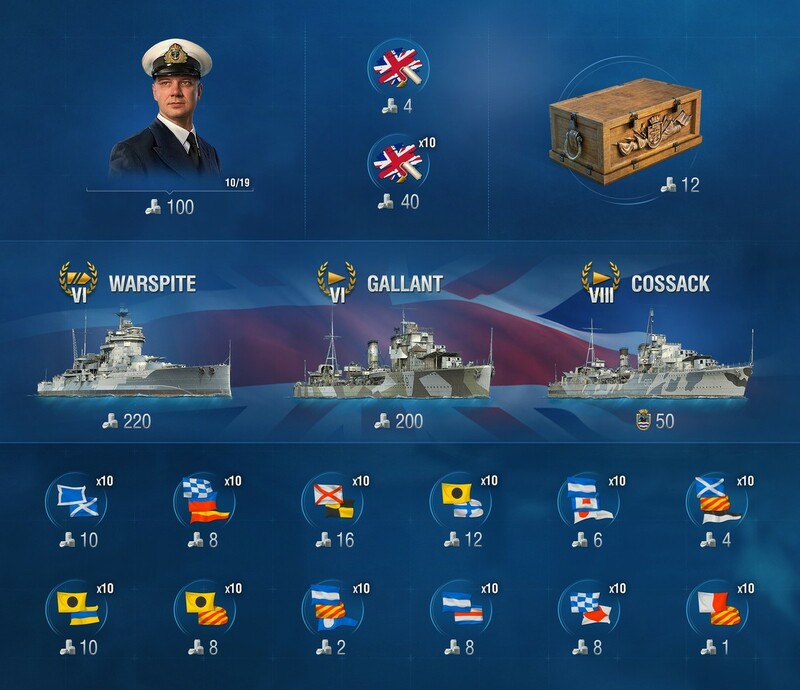 If you're determined to obtain all of the British destroyers in early access, you can try your luck and exchange Sovereigns for British containers. Another new arrival in the Arsenal is the Tier VIII premium destroyer Cossack, available for 50 Guineas. 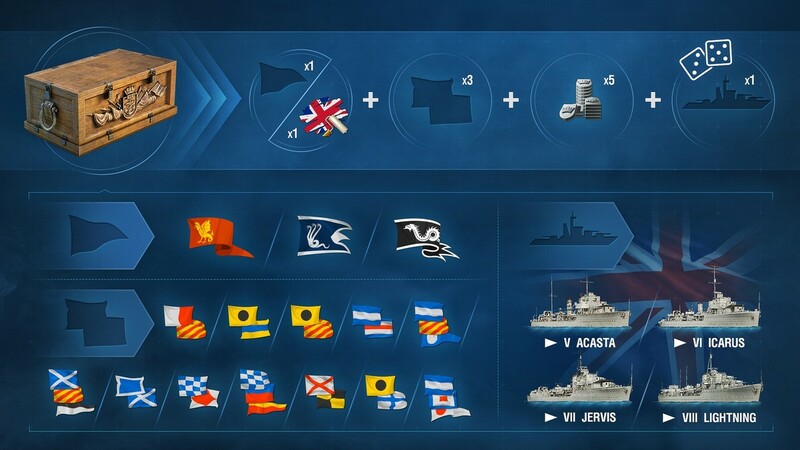 In the course of three updates it’s possible to receive a significant discount for the destroyer—participation in the Royal Navy event can get you up to 48 Guineas. Once you have them, you only have to buy a few more Guineas from the Premium Shop and that Tier VIII destroyer is yours! Coupons don't work in this temporary category. Open containers and be one of the first to welcome the Brits in your Port!